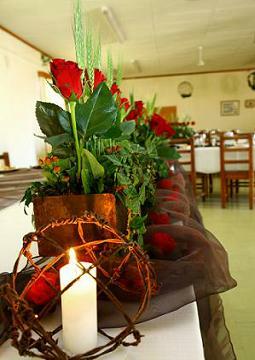 Wedding Flower arrangements are one of the primary focal points at any wedding. With the exception of the brides dress, flower arrangements are going to be one of the most commented upon items of your big day. Since so much focus is going to be on these flowers, why not make them super special? Here are some specific ideas I hope you can use to really make your arrangements stand out. Add little touches to give your wedding flower arrangements that homey feeling, and make them super cute at the same time. Some simple old buttons, in your theme colors of course can go a long way in adding punch to your arrangements. Simply string floral wire, which is available in a rainbow of colors, through the button holes, and create a stem by twisting the loose ends together. You can use buttons of all shapes and colors. I love to use things you'd find around your house or garden to add a little country glamour, so rusty wire and old wood bins make great additions to rustic centerpieces. This arrangement blended rusty barbed wire and elgant roses, how unique! Add a hint of glamour to your basic flower arrangement in a snap. Use metallic spray paint on filler materials like pine boughs, lemon leaves or eucalyptus and add to your flower arrangements. Silver or gold work best, but even a metallic jewel tones or pastels could work with the right flowers and color scheme. You could also spray on floral adhesive and sprinkle your floral fillers with a little super-fine glitter. I love this effect in winter theme weddings, I paint eucalyptus snow white, and dust with a little irridescent glitter for a sparkling snow-fall effect. 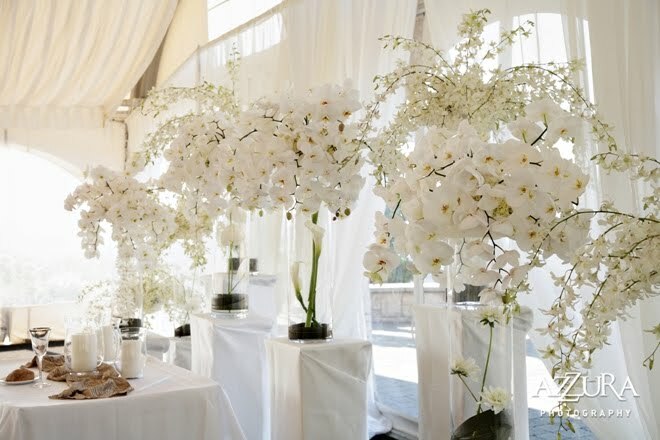 The Ombre effect is another great option for making wedding flower arrangements extra special. Basically your arrangements highlight a gradual lightening or darkening of one particular tone. Hot pink gradually fading to cotton candy pink for example. The overall effect is sophisticated and elegant, and you can do this with just about any color flowers. You may choose to follow some of the latest trends when choosing wedding flower arrangements. One of my favorite right now, is creating arrangements with angled, architectural shapes. Many brides are putting a twist on things by using square pomanders instead of round ones, in a nod to this trend. Another way to showcase this trendy look is to use use materials like river cane to create lattices to which you can attach your flowers. Another very special way to design and execute the perfect wedding flower arrangements is to use a pave technique. Now when you hear the word technique you may instantly conjure pictures of lots of work needing to be done. Don't fret, the name is fancy, but the concept is actually super easy, even for a floral novice. Just as the name implies this style is based on the same concept as paving a walkway. You simply choose your container, cut floral foam to fit, and place your flowers, snugly, and neatly in rows until you fill the container. It really is a snap and this style is an awesome choice for modern themed weddings. Be sure to saturate your floral foam with water after placing it in your vase, and for a bit of support use tacky floral tape to secure the foam to your container. These extra steps will ensure your flowers last through the end of your event. Get suggestions for cheap wedding flowers here!